Derived from coconut as the name suggests, this milk is produced by first grating dry coconut into very fine pieces like crumbs. Then these crumbs are soaked with a little water, then strained and compressed to extract the juice which is white like milk. Not to be confused with Coconut Water, a clear liquid which is readily present in coconuts. The milk has a distinct flavor and is a key ingredient in the making of Pina Colada. Rastafarians use it to cook just about everything in their style of cooking which is referred to as 'Ital Food'. Many West Indians also use it to flavor soups, rice, fish, meats, beverages and desserts. TIP: You can make coconut butter by putting the can of coconut milk in the freezer for 20 minutes. The butter will solidify on top, and you can use it for sauteeing. Coconut milk is a sweet, milky white cooking base derived from the meat of a mature coconut. The colour and rich taste of the milk can be attributed to the high oil content and sugars. The term coconut milk also refers to coconut water (coconut juice), which is the naturally-occurring liquid found inside the hollow coconut. Choosing: Shaking the can prior to opening will even it out to a cream-like thickness. Some brands sold in Western countries add thickening agents to prevent the milk from separating inside the can, since the separation tends to be misinterpreted as a sign of spoilage by people who have no experience with coconut milk. Buying: Canned coconut milk is available at almost all grocers. Look for it in the Asian food or Indian food sections. here in the Philippines, particularly in Zamboanga City, we can already buy the fresh coconut milk just by waiting for the salesman, locally called "tindero" to squeeze it out from the coconut meat. Procuring: In 1943, Johannes van Overbeek discovered that coconut milk actively encourages plant growth. This was later discovered to be due to a number of factors, but predominantly the existence in the milk of a cytokinin known as zeatin. It doesn't speed up growth in some plants such as radishes.The addition of 10% coconut milk to the substrate in which wheat is grown has shown substantial improvements in yield. This milk is produced by first grating dry coconut into very fine pieces like crumbs. Then these crumbs are compressed to extract the juice which is white like milk. Two grades of coconut milk exist: thick and thin. Thick coconut milk is prepared by directly squeezing grated coconut meat through cheesecloth. 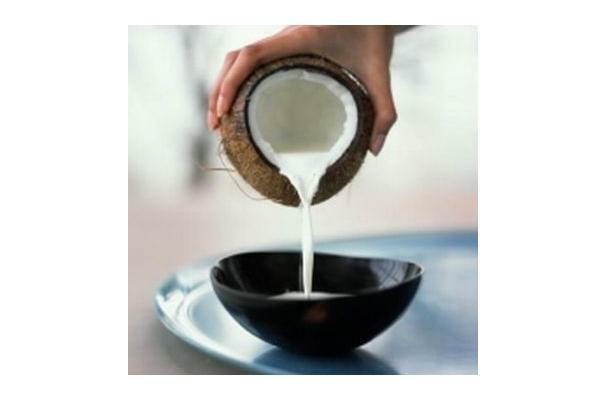 The squeezed coconut meat is then soaked in warm water and squeezed a second or third time for thin coconut milk. Thick milk is used mainly to make desserts and rich, dry sauces. Thin milk is used for soups and general cooking. This distinction is usually not made in Western nations since fresh coconut milk is usually not produced, and most consumers buy coconut milk in cans. Manufacturers of canned coconut milk typically combine the thin and thick squeezes, with the addition of water as a filler. Once opened, cans of coconut milk must be refrigerated, and are usually only good for a few days. If not, the milk can sour and spoil easily. You can empty the unused portion into a freezer safe container and freeze for up to 3 months. 1/2 Gallon containers of coconut milk are now sold in the dairy case at many grocers. It is used as a substitute for cow's milk. for fresh coconut milk, you cannot store it even on the right refrigerator temperature. not unless you you have to cook (just bring to first boil) it first then place in a clean and dry jar and store it in refrigerator. even freezing might sacrifice its quality. storing will only last for at least two days,if not consumed it will eventually turn sour. History: Coconut milk is a common ingredient in many tropical cuisines, most notably those of Southeast Asia (especially Burmese, Cambodian, Filipino, Indonesian, Malaysian, Singaporean, and Thai), as well as Brazilian, Caribbean, Polynesian, South Indian (Kerala) and Sri Lankan cuisines. Frozen coconut milk tends to stay fresh longer, which is important in dishes in which the coconut flavor is not competing with curries and other spicy dishes.